As a reminder, each Lakes of Rosehill resident pays for “back door” pickup of our garbage. It is not necessary to put your trash out on the curb. This keeps our neighborhood looking better on trash day! The exceptions to this would be if you have any large trash items, or over and above your normal number of trash cans to pick up, or the recycling bin. In these cases, you are advised to put the trash and the recycling bin on the curb. On all other “normal” trash days, they will pick it up by the by your back door or garage. 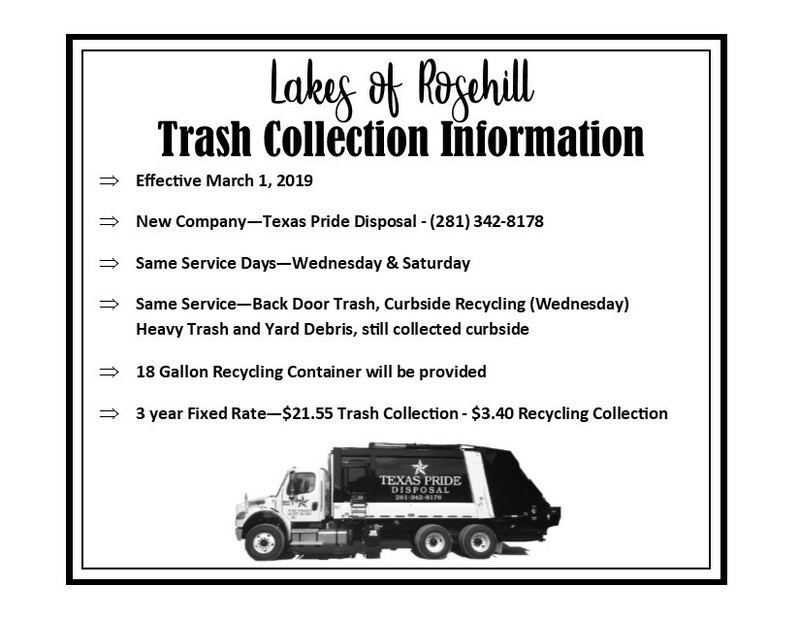 As of March 1, 2019, LOR Trash will be collected by Texas Pride Disposal (281) 342-8178. Texas Pride Disposal Service Guidelines can be found here. If you need a new recycle bin, contact Texas Pride Disposal. If you have questions, contact Gloria Lee at Chaparral Management. ****** Please Note: (posted 1/10/19) Waste Management will cease to offer trash & recycling services of the type we currently enjoy in LOR as of 2/28/19. If you would like to get involved with the neighborhood watch program in our neighborhood, please contact the LOR Board. This is a great way to get involved and help keep our neighborhood safe. If you are new to the neighborhood, find your Block Captain and give them your email to stay informed. As Lakes of Rosehill residents, we live in Precinct #4. The Constable for Precinct #4 is Mark Herman. The Sheriff’s main number is 281-446-1196 (non-emergency number). Dial 911 for emergencies. The Department has compiled a list of maintenance companies residents can choose from when looking for a new company. In selecting a company you need to make sure they service our type of systems (Clearstream) and are licensed. You can download the list here.